Yusuf El Mezghildi was born in Tetouan, Morocco in 1962. From the age of 5, he attended the sufi gatherings at the Zawiya Kittaniya with his father, where he learnt to sing traditional devotional songs. He continued his musical training at the Conservatoire of Music of Tetouan, where, over the course of ten years, he studied Andalusi, Arabic, and Western classical music, studying 3 years of piano. He studied the lute with the distinguished teacher Mukhtar Mufarej, and also studied under the former Director of the Orquestra of Tetouan and head of the Academy of Music, Muhammed Larbi. At the age of 25, he took up the qanun, studying privately with the master Haj Ahmad Said. Al Shabab, Al Hilal and the Orchestra of Chekara from Tetouan are among some of the well-known groups he has played with. He has also accompanied and recorded with some of the best known singers of Morocco. He moved to Spain in 2002, settling in Granada where he now resides. 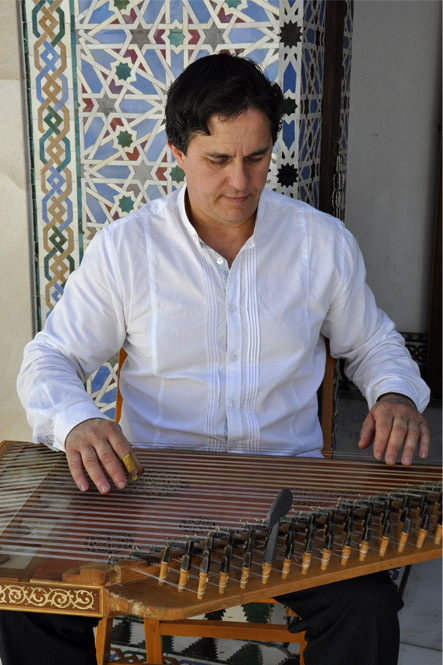 He has experience playing in diverse styles of music; Flamenco, Andalusi, Arabic and Medieval, with groups such as Al Tarab, Turath Al Andalus, Alquimista and Al Kauthar. In Spain, he has performed and recorded with many famous artists, such as Enrique Morente, José Merce, Lole y Manuel, María Valverde and El Lebrijano. He has been with Al Firdaus Ensemble since its beginning, in 2012, performing with them in concerts and festivals in Europe, North Africa, Turkey, Lebanon, the U.S. and Malaysia. He has recorded on both their CDs Safa, and Nur, contributing on the qanun and lute and as an arranger.